A year that started with a fidayeen attack has left a trail of blood. It has been called Kashmir’s “bloody Sunday”. 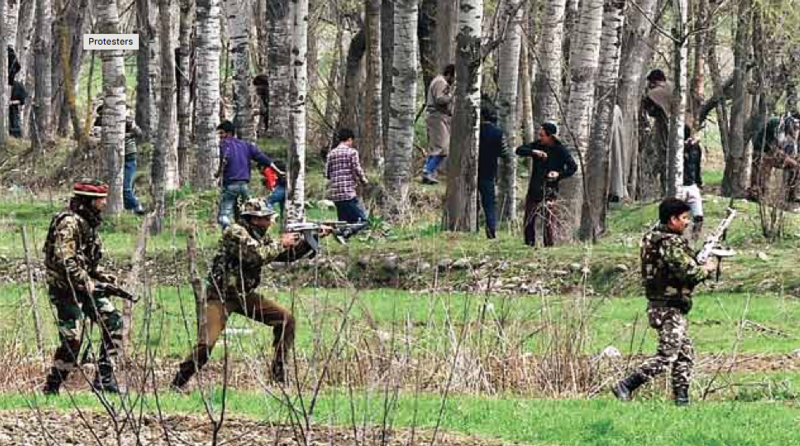 Joint operations and civilian protests in South Kashmir on April 1 claimed 20 lives: four civilians, three Army personnel and 13 militants. Two days later, a young man injured by security forces during clashes in Central Kashmir succumbed to his injuries. In the week that followed April 1, suspected militants killed two civilians in Hajin, in North Kashmir’s Bandipora district. Up in the hills, guns boomed at the Line of Control. One more militant was killed in a gunfight in South Kashmir. A year that started with a fidayeen attack – a term used to describe suicidal strikes by militants with the intention of a prolonged stand-off – has left a trail of blood. The number of militants killed in the hinterland, or the area inside the Line of Control and the International Border, till April 1 has exceeded the figure for the same period last year – 51 in 2018, up from 33 in 2017. At least 32 security forces personnel and 25 civilians have been killed in the hinterland till date. According to the South Asian Terrorism Portal, 29 people, including civilians and security personnel, have been killed in ceasefire violations at the frontier, as of April 1. The number of casualties in Jammu and Kashmir in 2018 is 138, which means that, on average, at least one person has died every day. 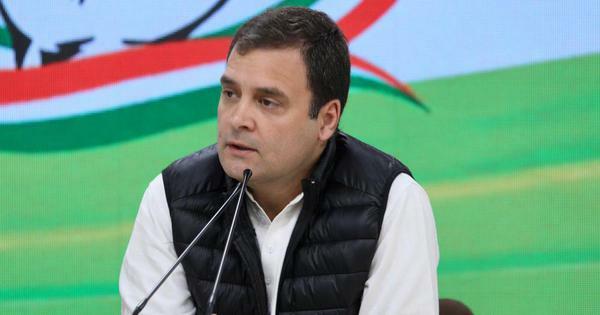 That is excluding the number of cross-border infiltrators shot down at the Line of Control and security personnel killed in border skirmishes. Broadly, four forms of violence claimed lives in Jammu and Kashmir: gunfights between security forces and militants, and the protests surrounding them; militant attacks on security instalments; abductions that ended in death; and cross-border conflagrations. Gunfights not only claim the lives of security forces and militants engaged in battle but also of civilians who, increasingly in recent years, get close to these sites to pelt stones in an attempt to disrupt operations. Before the deaths on April 1, at least four persons were killed after security forces opened fire on stone-pelting crowds. On January 27, soldiers of the Indian Army opened fire on civilians during a clash in Ganowpora, in Shopian district, fatally injuring three, including a minor. Five days later, a 10-year-old child injured by an unexploded shell in Shopian died of his wounds. On February 19, a 60-year-old man, believed to be mentally challenged, was killed as he wandered into an Air Force base in Central Kashmir. In March, four civilians were killed in reported shootouts in Shopian. To prevent civilian casualties, the state police have reportedly devised a “new strategy”. Operations should start at night and wind up by first light, Jammu and Kashmir’s newly appointed inspector general, Swayam Prakash Pani, told Greater Kashmir. In the past, security agencies avoided conducting operations late into the night. This data compiled from news reports does not include casualties at the Line of Control. There have been three major militant attacks so far this year, all claimed or attributed to the Pakistan-based Jaish-e-Mohammad. The year started with a fidayeen attack in South Kashmir’s Pulwama district, which left five paramilitary soldiers and three militants dead. It was the first time in years that local Kashmiris were part of the fidayeen squad. On February 12, the Jaish struck again, this time at the Sunjuwan military station in Jammu. Six Army men and a civilian besides the three attackers were killed. In March, security forces killed the alleged mastermind of Jaish’s fidayeen attacks in South Kashmir. In the first week of January, four policemen were killed in Sopore as an improvised explosive device exploded in the town’s market area. The attack, also claimed by Jaish, coincided with the anniversary of the 1993 Sopore Massacre, in which 53 civilians were killed in clashes with Border Security Force personnel. On February 6, two police guards escorting Lashkar-e-Taiba militant Naveed Jutt to a Srinagar hospital were killed as the latter escaped custody. A week later, another fidayeen attack by Lashkar militants was foiled in Srinagar. 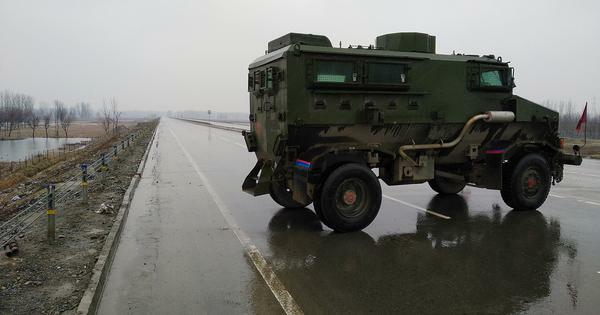 In March, two non-regular employees of the state police, called special police officers, were killed by militants. 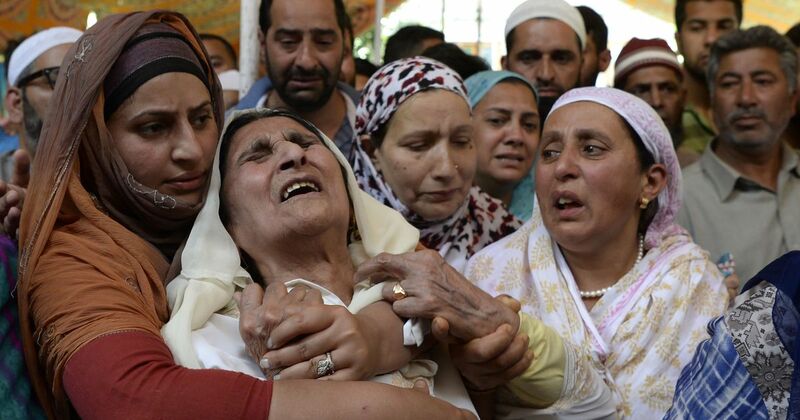 The wife of slain policeman Mushtaq Ahmad Sheikh was also critically injured. Indian and Pakistani security forces have increasingly targeted each other with small arms fire and mortar shelling along the Line of Control. According to government figures, there were 633 ceasefire violations in the first two months of 2018, with 12 civilians and 10 security forces personnel killed. 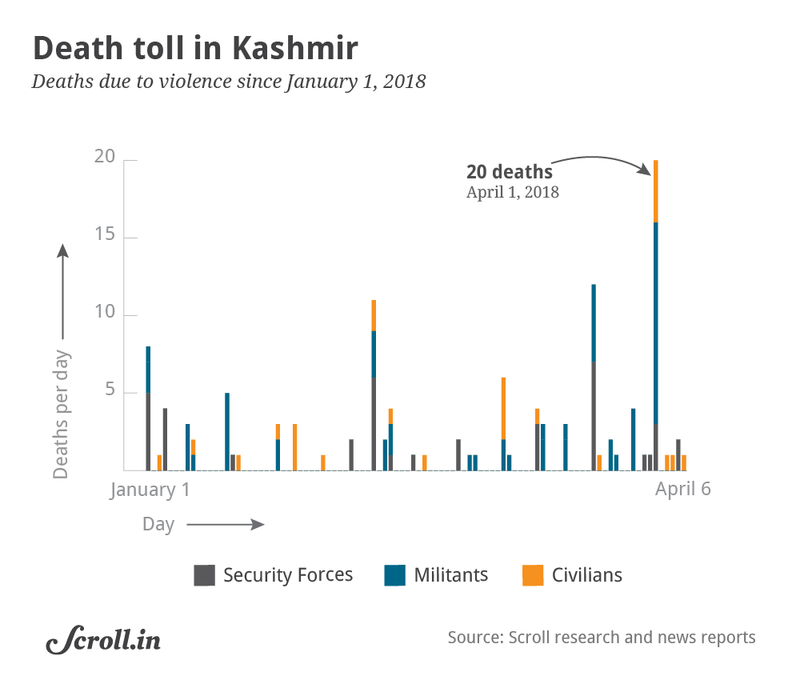 According to the South Asia Terrorism Portal, at least 14 security forces personnel and 15 civilians have been killed till April 1. The portal’s data, however, is partial and numbers occasionally reported by state agencies are significantly higher, according to its executive director, Ajai Sahni. Hundreds of border residents were displaced by the ceasefire violations, forced to leave their homes for makeshift camps further away from the line of fire. On March 18, a family of five was killed when mortar shells hit their house in Poonch district. In a deviation from routine, the two armies traded mortar fire along the Line of Control in Uri in North Kashmir. Border residents complain of helplessness, living at the mercy of the two armies and neglected by the government. Since last year, “unidentified gunmen”, familiar during the peak of the militancy in the 1990s, have started killing civilians again. This year, a spate of abductions hit the Valley, particularly Hajin in the north. The victims of these abductions were killed or later died of their injuries. According to the police, these abductions were carried out by militants. At least six civilians have been killed by suspected militants since January. On January 3, 25-year-old Arif Ahmad Sofi was shot dead by suspected militants in the Sopore area of North Kashmir. Meanwhile, in Budgam district, a man affiliated with the separatist Hurriyat Conference was shot dead as he travelled in a Tavera by a gunman in a passing car. Between March 11 and April 6, four youth were abducted and tortured. Muhammad Shafi Sofi’s body was found in South Kashmir’s Pulwama district on March 11. Omais Bhat, a 20-year-old from Kulgam district, who had been abducted on March 8, succumbed to his injuries on March 22. The bullet-riddled body of Naseer Sheikh was found in a canal near Hajin on April 3. And the headless body of 25-year-old Manzoor Bhat was found in an orchard in Hajin on April 6. This is the second beheading in six months in Hajin.